Celebrating the ensemble’s 15th birthday at First Church Boston on Saturday April 30th, Chamber Orchestra Boston offered premieres of two adventurous commissions framed by sparkling Mozart concertos performed on a period fortepiano. The new works employed the instrumentation of the Mozart concertos: strings with two oboes and two horns. 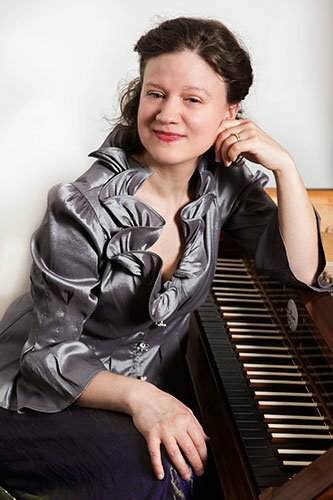 As soloist in the concertos, Sylvia Berry performed on an instrument by Chris Maene (Brussels, 1995) that is a replica of a 5-otcave Viennese fortepiano built by Anton Walter in 1795. Natural horns were employed in the Mozart, and the musicianship was impeccable and sensitive all around. Music Director David Feltner led with elegance and clarity, and offered some words of welcome and insight. Adrienne Elisha’s piece, “TrancenDance,” worked on many different levels, and tapped some deep resonances of the human psyche. Moved by the conflict in Syria, Elisha immersed herself in the folk music of the region, and the resulting confluence of musical ideas was evocative and powerful. It began with a sinuous piping of a desert shepherd—the oboe played with great emotion and a true Arabic sort of languor by Jennifer Slowik. Passages of string pizzicato produced a bouncy energy – a perhaps a vigorous group dance—contrasting with the meandering tunes (sensual and soloistic). The rhythm gradually built in energy, and the cascading propulsive melodies overlapped and exchanged. After some frenetic swirling, it receded to sustained and poignant harmonies (a la Górecki), becoming frozen panels, like memories recalled as a static tableau. These poignant harmonies suggest empathy—a precious human capacity that has become exhausted by the sustained crisis in a distant land, and that this piece may help to re-engage. Sometimes composers’ own descriptions don’t really present the most favorable view of a work. “Less is more” ought to be the guide for such writing, since we want the piece to speak for itself, and the composer may be too close to the creative process to grasp its overall impact. In short, Anaís Azul’s program notes led me to expect to dislike her work; I was pleasantly surprised that I found it quite compelling. I don’t deny that breath is one of its topics; its staid, steady rhythm attests to that, and breathing is (of course) an elemental feature of human life. But wind, as a force of nature, is constantly varied; that we didn’t have at all. And Feltner (in his comments) was right, the title “And in each dying breath, we learn to survive,” is too long. Instead of the spontaneity of the wind, there was a relentless, somber motion, a determined striding, increasingly bold with a disjunct and angular lyricism, but in the same ceaseless, measured steps. Within this restrained rhythm, a range of melodies emerged, some hugely expansive, others more delicate and hesitant. I did not need to ascribe a specific meaning to the music to feel it as effective and moving. The Mozart concertos (K. 246 and K. 414) were sprightly and delightful. Sylvia Berry is a spirited and nuanced performer whose performance, while not note-perfect, drew an amazing range of energy and expression from the delicate instrument (which itself provide a rich palette of tone colors). With the focus on women—the composers of the two new pieces, the dedicatee of K. 246, and Berry herself—one idea that would have further enriched the program would have been to include a concerto by one of the female composers contemporary to Mozart, such as Maria Hester Park, Amélie-Julie Candeille, or Marianne Martines. Maybe next time. But COB is to be commended for its creative programming and artistic polish. Thanks so much for the review! I just wanted to make a correction, if I may. I did not perform on an 1806 Broadwood, but on an instrument by Chris Maene (Brussels, 1995) that is a replica of a 5-otcave Viennese fortepiano built by Anton Walter in 1795 which is housed in the Germanisches Nationalmuseum in Nuremburg. Sadly this information was not included in the program, but I did speak about the instrument before playing the second concerto. (In fact, I am seated at the Maene in the photograph accompanying this article.) I did, however, record a disc of Haydn’s London Sonatas (Acis, 2013) on the 1806 Broadwood (#3448) that was restored by my husband Dale Munschy in 2011.